ETL IV: We Need to Go Deeper. "We need to go de....." *click-ak* "....I'll just shut up now"
Well, the shoulder is healing well. Still a LONG way to go, but I can paint. I also did some building. 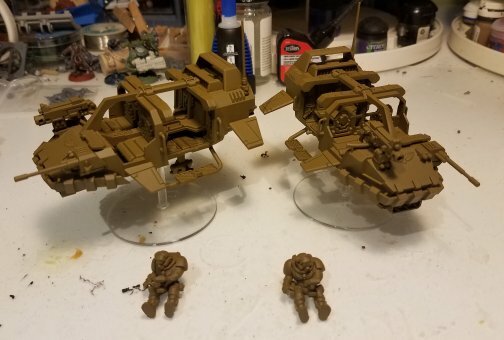 The two Landspeeder Storms I need for ETL IV are built. And primed. 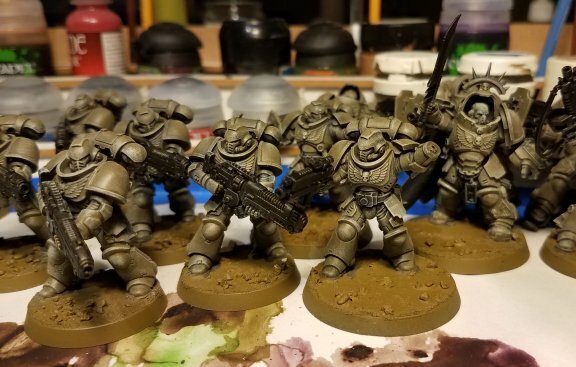 Since I can paint, but with frequent breaks and not in marathon sessions, I decided to chop the Primaris up into units to finish. Everyone is at the point where they need detailing. 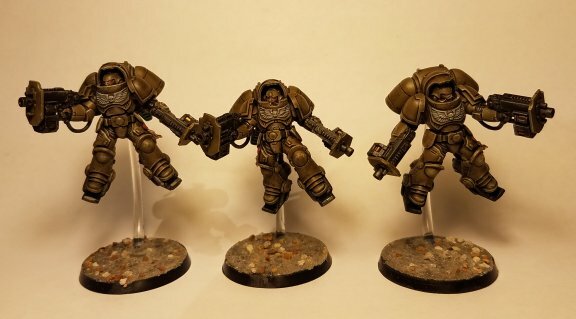 First up, the Inceptors. The first step is the chest eagles. 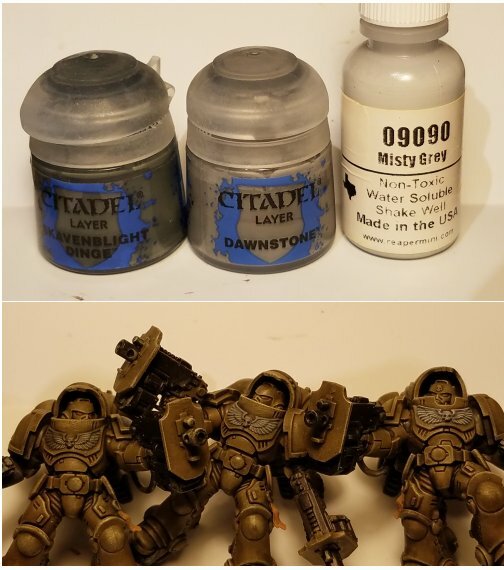 I paint them grey. Overcoat with GW Skavenblight Dinge, then drybrushes (with a tiny drybrush) of GW Dawnstone and Reaper Misty Grey. The lads model the steps above from left to right. I started with GW Turquois and various mixes of white to do the exhaust for the backpack. Plus a little wash of GW Nihilakh Oxide around the edges. I still have to do decals (which I'll likely do all in one sitting for the whole lot) and finish up the bases, but here they are. 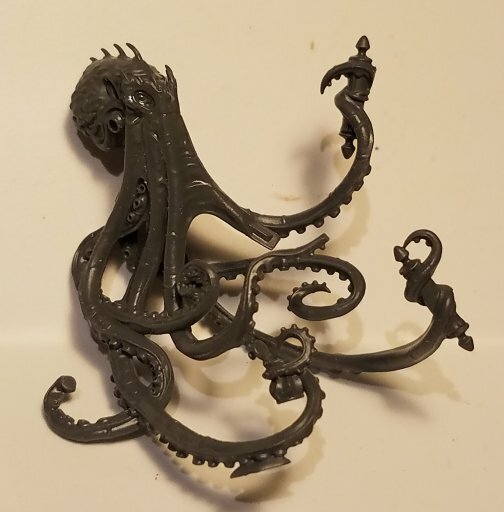 1: So, after priming, I do an overall coat with slightly thinned GW Charadon Granite. I know its not available anymore, but I'm sure there is something close. It serves the same purpose as my black/brown. Its thinned so some of the undercoat shows through, but it gives the other acrylics an acylic base to stick too, plus it fills in any gaps, creases and little spots I might have missed. Only a tiny bit shows through on the finished models, but it provides a shadow for recesses. 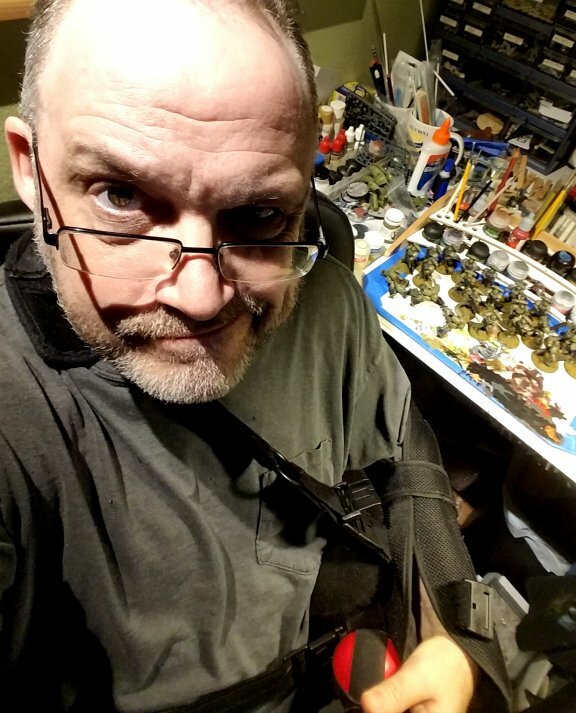 2: Then I do a heavy drybrush with P3 Battledress Green. This coat catches most of the model, but the undercoat does show through in places. It gives a nice olive to all the bits like shoulder plates and the bulk of the other armor, but you end up with shadows under the arms, etc. 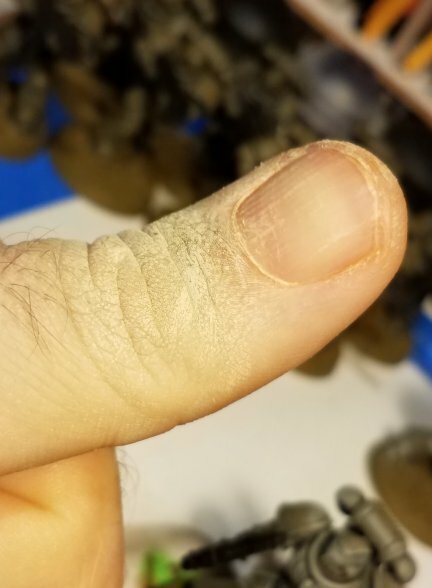 I call it a heavy drybrush, because I'm not really doing a full coat. 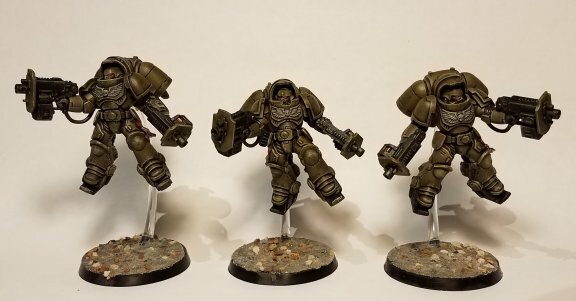 3+4: Then a more traditional drybrushed duo. 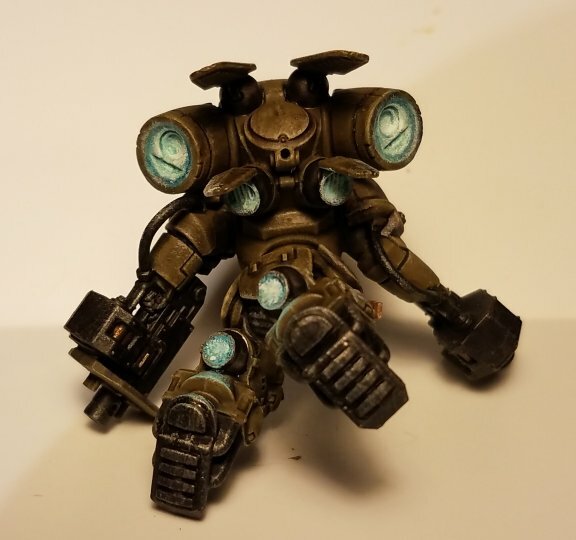 First, GW Gretchin Green. With this I hit the raised areas and large plated to "green up" the olive a little. Its fairly subtle, but it shows through on the end product. 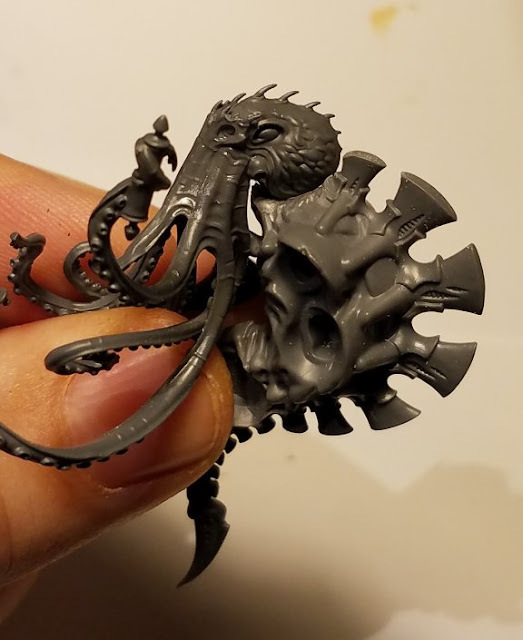 Then an overall Drybrush with GW Screaming Skull (Bleached Bone) This one catches all the raised detail, edges of plates, maybe a bit heavier around the foot area where there will be dirt and the pouches and such, which will get some brown washes and highlighting later. You can see what I mean in the pics below. 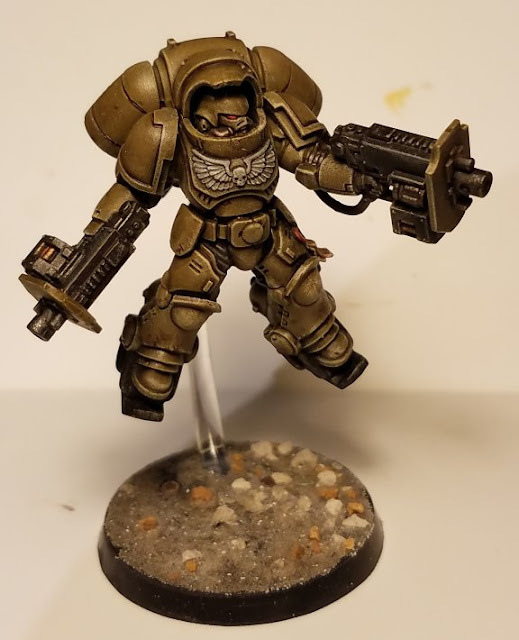 5: And finally, a simple overall wash with GW Althonian Camoshade for the final tone of the armor. 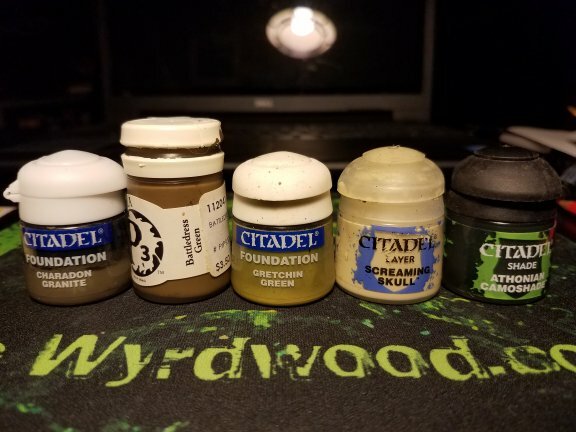 Later, I will go in with more of the same color to deepen some areas and I'll also mix it with Druchii Purple for any pronounced shadows I need. Those two colors work great together. Never be afraid to mix the shades. 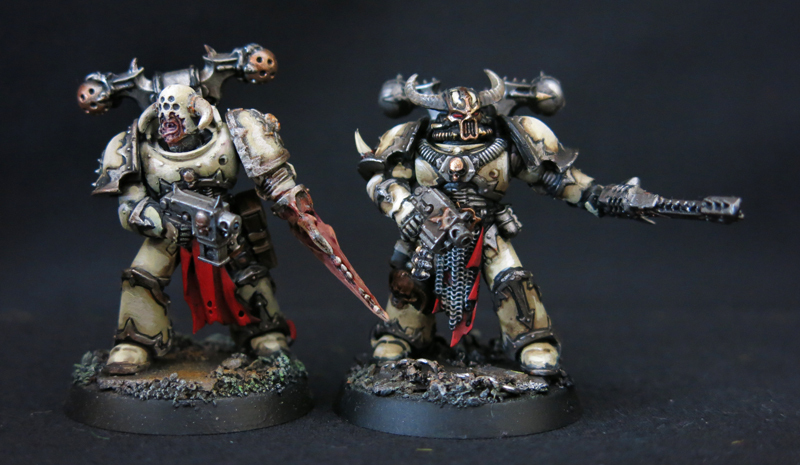 You can see the rather "harsh" Screaming Skull drybrush job that was done to these guys overall. 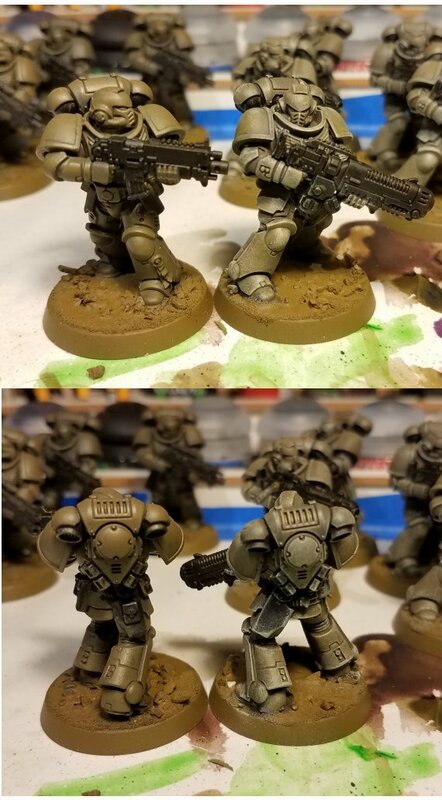 I use a 1/0 brush and give them a pretty even wash, so you get this sort of difference. On the bottom, you see what the end result for the olive armor will be after some additional shading with the washes. Plus his chest eagle is painted in greys. The pouches are finished. All that is left for the armor is to weather it and paint any details. The endless highlight drybrushing of GW Screaming Skull over all the olive good ness. 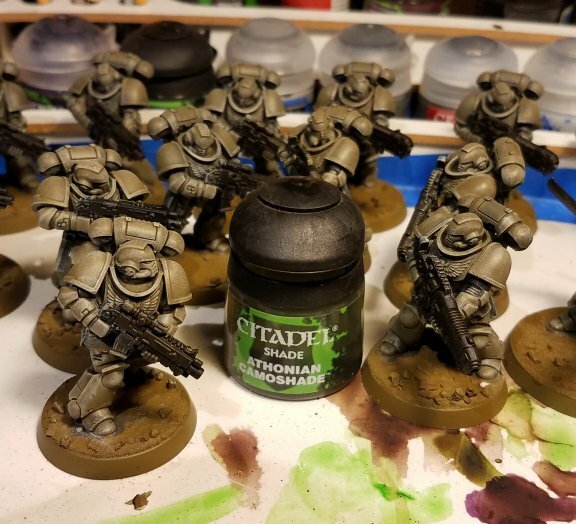 After this step a wash of GW Althonian Camoshade. Then I'll go in with washed to bring out the details. Paint the grey eagles, then its decal time. Then weathering and basing. 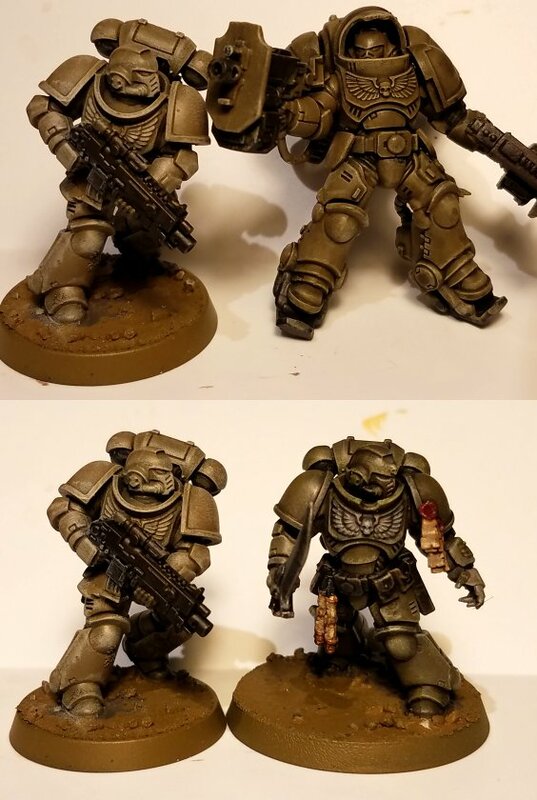 Here's a comparison shot of before and after.